Graphical HTTP Client has been in the app store for roughly 2 months now and has had a few updates, but I haven’t quite added as much as I’d original hoped to. I’ve been able to devote more time to it recently and have just submitted 1.0.3 to the App Store. If history is any indication, it should be available in roughly a week. I plan to submit 1.0.4 in the next few weeks and generally update the app more frequently over the next few months. On a side note – I spent some time playing around with NoSQL technologies (Riak and MongoDB, specifically) over the weekend. One interesting thing about the current crop of NoSQL solutions is that many of them offer an HTTP interface. I found this tool to be quite handy when interacting with Riak and Mongo, and I’m now brainstorming ideas for making it even more useful for working with NoSQL solutions – I am kind of excited by some of the possibilities! If this interests you at all, please let me know what ideas you have. Probably the worst thing about Graphical HTTP Client in its current state is the way you enter and update request headers. It works, but it is kind of clunky and some unexpected things can happen if you aren’t careful. It turns out, a table view isn’t the easiest thing to work with for this kind of data. In 1.0.3, I’ve modified it so that there is a new sheet for adding and updating headers. Clicking on the + button will bring up this sheet, which lets you pick from a list of header names. 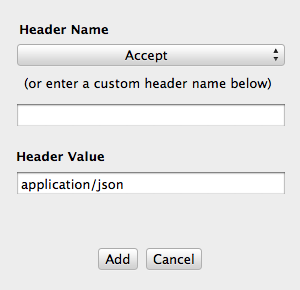 You can also enter your own if it is a non-standard header. To edit a header, just double-click on its entry in the table. It won’t let you save over another header, which was a problem with the old table (actually, it would sometimes lock up if you even tried). – Documentation for standard headers, including example values. – Some form of auto-complete for values (for example, if you select ‘Accept’ or ‘Content-Type’, we can give you a list of standard content types to choose from). Also, double-clicking on a response header row will pop up a read-only sheet that shows the full header name and header value – this can be helpful if you are dealing with longer header values. – Validate Certificates. True by default. This allows you to tell it to NOT validate SSL certificates, which can be handy if you are using self-signed or internal certificates for your sites/services. – Follow Redirects. True by default. Unchecking this will cause the tool to stop when it encounters a redirect. – Compress Request Body. False by default. If checked, this will compress the request body. – Allow Compressed Responses. False by default. If checked, this will allow the server to send GZIPped responses. All of these options are scoped to the request and will be saved along with the request, so if you load it back up later, it will remember your options. This is a fairly trivial feature that shows you the number of times your request was redirected. In the future, I plan to record information (url and headers) about each redirect and provide a way for you to view that data, which could be helpful for diagnosing redirect issues. If we can see that the response is an image (by looking at the content-type header), we’ll try to show it instead of the blank text view. Not a huge feature, but if you are ever loading images via the tool, it will save you from having to save the image and go to another program to view it. 1. Fixed an issue where the ‘Copy to Clipboard’ functionality wouldn’t work properly in certain cases. 2. Fixed an issue where sometimes old data hung around when you loaded a request from a file. 1. The ability to upload binary data. This is something I badly wanted to get into this release, but it will for sure make it into the next one. 2. More improvements to the header functionality, as mentioned above. 3. Also as mentioned above, more information about redirects. 4. The ability to set preferences for certain things. 5. It will save your last X number of URLs, so you can re-use them easily. 1. The #1 feature folks have requested is the ability to use OAuth integration. This is useful for working with services like Twitter. 2. Better formatting for non-JSON responses. 3. Color-coding for response bodies (ie, JSON and XML). 4. The ability to paste in a CURL command and have it be parsed into the tool. This was suggested by someone on the suggestion forum, and once I went through the Riak tutorial, I realized how handy it could be. Thanks to everyone who uses this tool, has provided feedback, and left ratings/reviews on the app store. If you have feedback on how this tool could improve, don’t hesitate to let me know.